‘Choose the book over the bottle, say no to drugs and alcohol and together let’s create decent work for youth,’ this was the message to the youth of Eldorado Park by the National Youth Development Agency (NYDA) Executive Chairperson, Yershen Pillay. The NYDA today hosted a Jobs for Youth Summit in Eldorado Park, South of Johannesburg which saw a host government departments, civil society groups and private sector stakeholders like the Johannesburg Metro Police Department (JMPD), the Department of Social Development, Small Enterprise Finance Agency (Sefa) and the Department of Home Affairs sharing information about their products and services available to youth. The aim of the programme is to empower young people to strive for decent work as opposed to a life ravaged by drug and alcohol abuse. Wayne Minnaar, Johannesburg Metro Police Department (JMPD) Spokesperson said that there are a range of job and training opportunities within the JMPD for youth, from traffic controllers to Metro Police Officers, and encouraged young people to make the most of these prospects. “The partnership between the NYDA, Sefa and the Industrial Development Corporation (IDC), is aimed at assisting youth owned enterprises by pooling our resources together. I urge you to identify a gap in the market and come to us and we will help you turn this idea into a business provided it is viable. Customers want quality so we challenge you to differentiate yourself from your competitors,” said Don Mashele, Sefa Head of Regions. 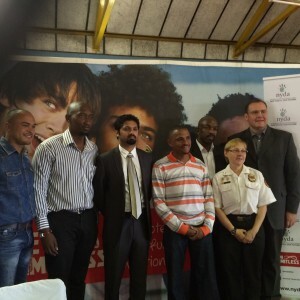 Youth Month 2013 was celebrated under the theme Working Together for Youth Development and a Drug Free South Africa. While it’s been over a year since this campaign was launched by government, the fight against substance abuse is far from over and requires ongoing, intensive efforts by all stakeholders. The disadvantaged community of Eldorado Park is bustling with opportunity but the reality is that residents are still faced with a range of challenges, from unemployment and poverty to crime and substance abuse. Caption: ANCYL branch representative: Tashreeq Samodien, Moseko Modibedi from the Department of Home Affairs , NYDA Executive Chairperson: Yershen Pillay, Ward Councillor: Peter Rafferty, Don Mashele from SEFA, Theresa De Klerk from EMS and Daniel Van Vuuren NYDA Executive Manager.